The unique new spatula with a precision gripping action. 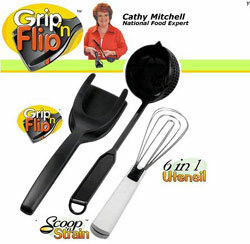 Grip n’ Flip is the unique new spatula with a precision gripping action. Now, no more broken yokes or chasing that sausage around the skillet again. You can turn over just one strip of bacon or lift out the whole batch. They’re even great for the barbeque - You’re never going to chase those hotdogs around again, and they’re delicate enough to turn over even fish.